John Stephens is also the author of The Fire Chronicle, the second installment in the Books of Beginning trilogy. John received his MFA from the University of Virginia, and went on to write and produce television for ten years. During this time, he read His Dark Materials by Philip Pullman and fell in love with fantasy for young readers. He spent the next several years waking at 4 AM every morning to write The Emerald Atlas before heading to work for the day. John lives in Los Angeles with his wife and sons and their dog, Bug. 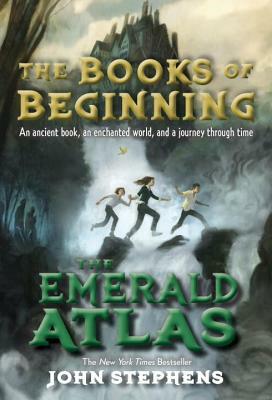 Visit BooksofBeginning.com to find out more about The Emerald Atlas, the Books of Beginning, and John. "Unfolding magic and secrets deepen the story and build excitement as it reaches its complex and time-bending climax....Echoes of other popular fantasy series, from “Harry Potter” to the “Narnia” books, are easily found, but debut author Stephens has created a new and appealing read that will leave readers looking forward to the next volumes in this projected trilogy." "This fast-paced, fully imagined fantasy is by turns frightening and funny, and the siblings are well-crafted and empathetic heroes. Highly enjoyable, it should find many readers." "[A] great story is all in the telling, and in 'The Emerald Atlas' the telling is superb...First-time novelist John Stephens has created a vicarious adventure for children ages 9-15—the first in a trilogy—filled with unexpected twists and marvelously distinct and vivid characters." "With magic, humor and unforgettable characters, John Stephens’ remarkable debut novel follows Kate, Michael and Emma as they attempt to outwit the Countess, rescue the children and maybe even save the world in the process. Unanswered questions and two more books to locate ensure a sequel and more robust adventures ahead." "“Creativity and wit abound in 'The Emerald Atlas.' Author John Stephens could have easily fallen into the trap of building on someone else’s ideas. But he doesn’t.